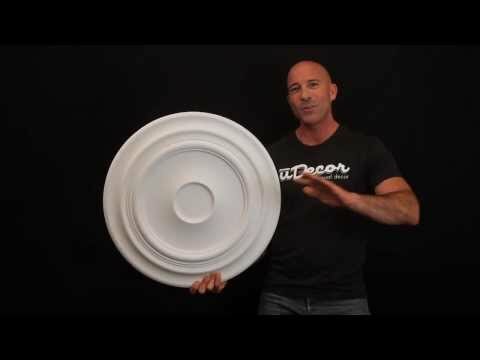 The MD-7008 Ceiling Medallion is 24-1/2" in diameter and has a depth of 1-1/2". Love my new ceiling medallion! So very happy with my choice to go with Udecor! Great selection and the easy how to install was so helpful. I will recommend to my family and friends. Found what I needed at uDecor. Easy Peasy ordering. They shipped right away. Arrived in great condition and I installed. What else can you ask for? That's the way it's supposed to work! Thanks uDecor. The color is a bit off from the light, will have to re-paint it with some tough up paint. The raised center on the medallion prevented our chandelier canopy from fitting properly, so I could not use this medallion. Since the center hole had been enlarged, I could not return it. used in a room that is a smoking room environment - very mens club-like. Love it. Great product. Very high quality, high density, easy to work with. Painted wall color between the ring and medallion. Looks beautiful.